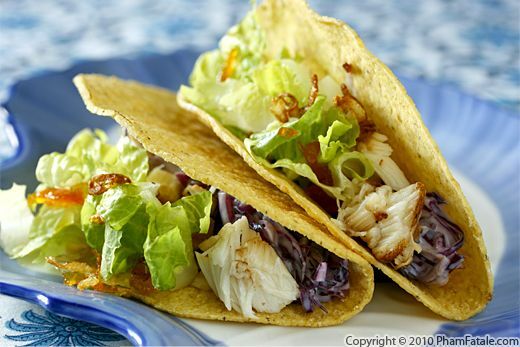 This fish taco dish is healthy, flavorful and easy to make. I cooked cod fillets en papillote, which just means that I wrapped the fish in paper and baked it in the oven. The pocket created by the parchment paper acts as a steam chamber and let the fish infuse with whatever ingredients you place inside. 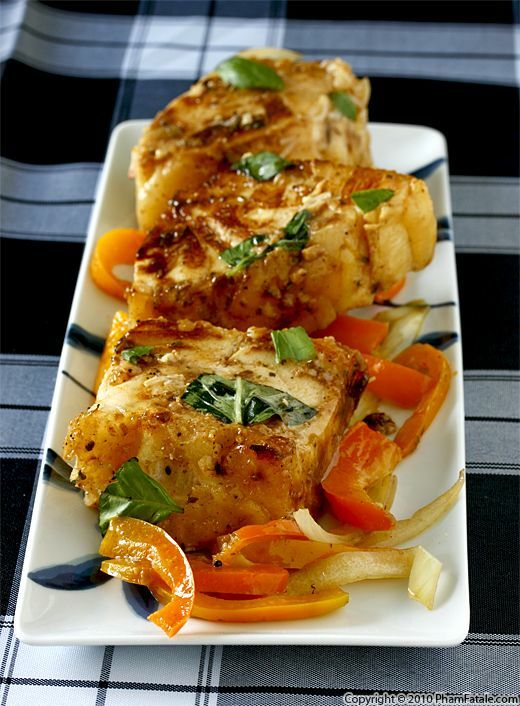 For this recipe I flavored the fish with garlic, ginger, fresh kumquat and creeping red thyme. I assembled the tacos with a slightly adapted version of yesterday’s creamy coleslaw recipe and some sweet preserved kumquats. This is the meal that Chef Doreen described to me by email, except Doreen used red snapper. Everyone loved it, and I'll definitely be making this again over the summer. It’s really a perfect recipe for picnics because you can cook everything ahead of time and assemble right before eating. The cod turned out great, but really any flaky fish will work. If you want to serve veggie tacos at the same time, check out my soy chorizo version. Sea bass has a very luxurious, delicate, buttery texture. I usually cook this particular fish when we have dinner parties. For this occasion, I smothered the fish in a garlic lime chipotle chili sauce and paired it with orange bell pepper, onions and non pareil capers. I served braised fennel on the side. I didn't do it this time, but if you want to maintain the exotic theme, you could also serve plantains. I grilled the sea bass medallions and finished baking them in the oven for optimum tenderness. The seafood dish is flavorful, yet still pretty healthy. That means you and your dinner guests can enjoy the meal and feel good about it too! Súp măng tây nấu cua (white asparagus crab soup) was always a festive dish when I was a child. We would have it whenever my parents had non-Vietnamese friends to our house for dinner. I would help with cracking the crab and gathering the crab meat. Corn starch, used as a thickening agent, gives the velvety, thick broth gives the dish a unique texture. While white asparagus doesn't provide a lot of color contrast to the crab, it does complement the flavor quite well. The authentic version of this soup requires shark fin, but given how expensive it is, crab alone is used instead. 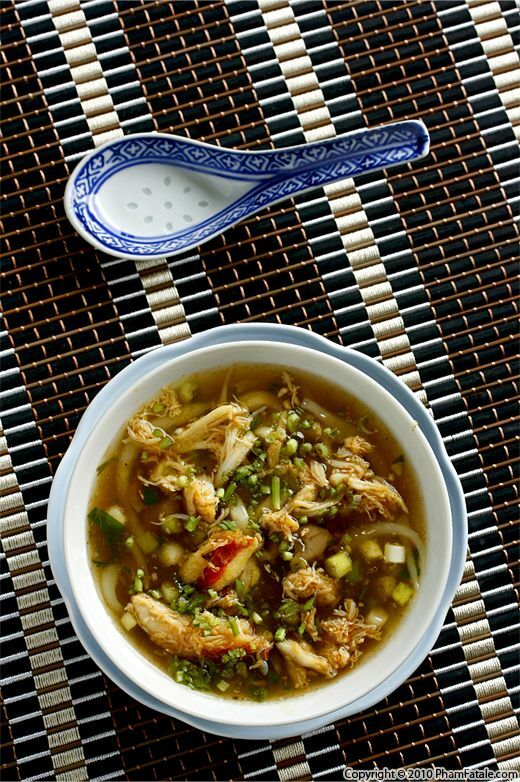 The dish still has a luxurious quality, and as such, white asparagus crab soup often appears on the menu at Vietnamese weddings. Now you don't have to crash a Vietnamese wedding to try this dish; make it the next time you throw a dinner party, and I guarantee it will be the highlight of the meal. 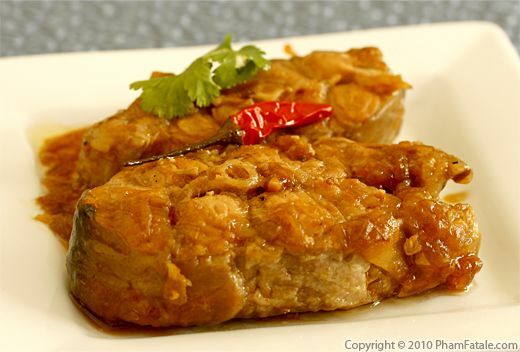 Cá kho tộ ("braised fish" in Vietnamese) is delicious catfish simmered in a caramelized sauce with garlic, ginger, green onions, fish sauce and red chiles. What I love most about the dish is eating steamed jasmine rice with the sauce made with coconut soda. I love seafood, but the vegetarians in my home aren't always happy with the aroma of fish wafting through the house. Braising fish in nước mắm gives a strong smell to this dish, so I don't make it very often, even though I love it. P Fish can seem challenging to make at home but, pavé de saumon caramélisé (salmon teriyaki) is an ultra-easy recipe. All you need to do is ask your fishmonger to prep the salmon in advance for you. I made a teriyaki-inspired glaze to go with the salmon and served it with rice. Page 4 of 28 pages.